Research by Stony Brook, Drexel and Villanova Universities led by entrepreneurial psychology expert Richard Chan indicates that your business name can influence how much money you get from early and late-stage investors1. “Linguistic and phonetic fluency distinctively influence investment decisions in different stages,” says Chan. 🔖 Linguistic fluency indicates how frequently a word appears in common language, if at all. 🔖 Phonetic fluency assesses the patterns of letters in a word and how often those sounds appear in other areas of language. In essence, hard to spell and pronounce names are not well remembered. Entrepreneurs could achieve more favorable financing outcomes in pre-venture stages and attenuate IPO underpricing in post-success stages by adopting a more phonetically fluent company name. When a word is familiar it can “assuage investors’ feeling of risk and elicit their experience of ease in processing information,” according to Chan. In other words, common dictionary words make people feel more comfortable investing in your company. Take Uber as an example – the company name is unique but also easily pronounced and is found in common speech. 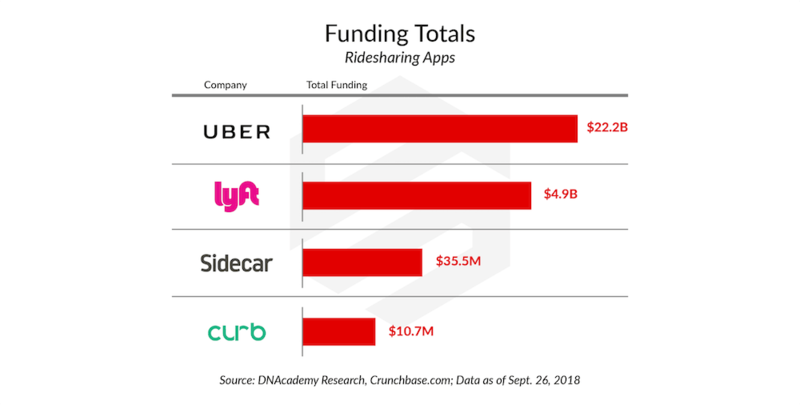 If you compare Uber’s brand and domain name (Uber.com) to one of its competitors, Lyft (Lyft.com), it’s easy to recognize how Uber’s domain name is more phonetically fluent than Lyft and how that name has helped it to become the number one ride-hailing company for consumers in the U.S.
Bitcoin wallet provider Blockchain is another example: when the company raised $40 million series B round in mid-June 2017, they were able to slingshot off the explosive growth of bitcoin2 – which has trended up alongside, and because of, blockchain technology. Holding the killer brand and domain name Blockchain.com brought in huge amounts of traffic because of consumers’ familiarity with the word. They would not have gained nearly as much traffic, and success in fundraising, if their domain name was not a recognizable word like Blockchain.com. Many new businesses put in a lot of effort to create a name that is fun and quirky, hoping that the new name will make them stand out from competitors. Companies like Snyk (Snyk.io, raised $32M to date3) and Epytom (epytom.com, raised $1M to date4) may have catchy or creative company names, but what are they saying to customers about their brand? ➡️ It is hard to tell from the name alone that these companies offer network security or create made-to-order clothing. In the study by Chan et al. (2018) on the effects of company name fluency on venture investment decisions, researchers warn about the dangers of creating a name that is too creative because unique names can make risk-averse investors feel uncomfortable. Creating authority from day one provides a huge advantage for startup founders and entrepreneurs. Adam Perzow, a Canadian entrepreneur who has previously owned Invest.com and Investing.com, recently spent almost $1 million on the domain Coins.com to establish a digital currency consumer brand5. Perzow believes premium domain names such as Coins.com allow a business to be perceived almost immediately as a category authority. “Think cars.com, hotels.com, insurance.com, escrow.com, vacationrentals.com – they are brands in one sense, but more so they are online category authorities or marketplaces that instill a sense of online trust that might have been missing,” says Perzow. Consequently, Cars.com dominates the car comparison website landscape with about 20 million visitors per month6 – even though CarMax.com (13 million visitors per month6) and TrueCar.com (11 million visitors per month7) pay for advertising on search engines, arguably because Cars.com is the authority in the topic – they say so right in their domain name. While it is possible to build authority with a suboptimal brand over time, premium brands and domain names provide that authority value instantly, giving your business an advantage that cannot be replicated by competitors. CEO of World Accelerator, Gary Millin, has often talked about the advantages that a strong domain can have for an early-stage business. He uses the Doctor.com case as an example of how the company was able to build a frontrunner position quickly and to create a powerful platform to expand into other opportunities8. Thanks largely to the strong domain name, Doctor.com rapidly grew to become the provider of the first universal online scheduling platform for doctors and their patients. And in 2017, just 4 short years after founding, the company merged with Connect Healthcare. Doctor.com is now part of a huge movement to create a “Digital Patient Journey” within many major hospitals and practices. Brands and associated domain names like Doctor.com allow a startup to build credibility and visibility in their field right from the start. Doctor.com isn’t the only example. Noah Kagan, the founder of Sumo.com, says a premium domain brings a sort of status and a level of seriousness9. That’s why he paid $1.5 million for the Sumo.com domain name back in 2016, the shortest version of his Sumo-named empire including AppSumo, KingSumo, and SumoMe10. It’s a lot of money – in fact, the Sumo.com sale is tied for the 83rd most expensive domain purchase ever – but Kagan knew it was the right decision because of the prestige the name brought. But you don’t always have to spend over $1 million to get this level of credibility and visibility. Spending $30,000 on the domain FullStory.com in May 2018 was “the best money I’ve ever spent…EVER,” tweets Scott Voigt11, 12. The purchase allowed Voigt to migrate from the old domain name of HomeBase.io and “lent a level of credibility” that he just didn’t have before. Perceptions of domain names have a huge effect on the level of risk investors and customers associate with a business, even though they may not know it. “Fluent names that are more easily pronounced tend to lower people’s perception of risk toward associated objects,” says Richard Chan1. For the customer, this perception is often interpreted as reality. This will have a huge impact for new businesses. “A marginal domain suggests you’re a marginal company,” says Paul Graham of Y Combinator, who also suggests that not having the .com suffix to your domain name signals weakness13. A marginal domain suggests you’re a marginal company. In contrast, an exceptional domain name suggests that you’re an exceptional company. How else could you own a domain name like Amazon.com, Uber.com or Apple.com? Either you had the vision and foresight to understand the value of a great domain name matching your great brand, or you were creative and persistent enough to make the acquisition happen. The CEO of Box, Aaron Levie, paid just shy of $1 million for Box.com to upgrade from Box.net so that he could simply use the brand “Box” for his company. He was prepared to pay even more than $1 million if needed – “It will be better for the next 10 years just to be ‘Box,'” said Levie14. Today, Box.com is traded on the NYSE and is valued at $3.6 billion as of the date of publication. Many successful founders have come to realize the benefits of a killer brand after the business has been established, and thus upgraded their company brand and/or domain name over time. Peter Coppinger knows this all too well: he bought the domain name Teamwork.com for $675,000 because he had a feeling it would take his company to the next level15. He was tired of having great technology, a cadre of customers who loved his company, but a terrible domain name: TeamworkPM.net. As a result, his company spent all their cash reserves to acquire Teamwork.com. It was a lot of money, but the investment in Teamwork.com quickly paid for itself in the 12 months following the acquisition15. The purchase transformed sales for the company and brought a new brand identity, which they now proudly display on their walls, on shirts, on cars and at any opportunity they can. For customers and investors, “all you have got to remember really is teamwork. The word teamwork,” says Coppinger. And from the moment they launched on Teamwork.com, their sales took off -- resulting in a 10% increase in new business from referrals. Plus, they started getting listed in position 3 of the top 10 teamwork apps reviews whereas before they never even made the list. Examples like Teamwork.com show just how valuable a straightforward, memorable name can be. The most prominent example is Mark Zuckerberg’s domain name change from TheFacebook.com to Facebook.com. Zuckerberg regrets not buying Facebook.com from day one and is quick to mention that he would “get the right domain” when asked what he would do differently during a Y Combinator interview16, 17. It’s a powerful lesson for all new business owners. While premium domains bring many benefits to a young company, throwing out $50,000, $100,000 or $1 million on a domain name will not guarantee success. You first need to have a great product or service that solves a real problem for people. During the early stages of a company, a fun, easy-to-acquire domain name may be all that the business needs or can afford. However, when it’s time to get serious about your brand and the impression you leave with investors, partners, suppliers and customers, then it’s time for you to purchase a great domain name. If you have a growing business, the creation of a killer brand and the associated purchase of a strong domain name could be just the fuel that’s needed to set your company afire. This article is republished with permission from https://www.dnacademy.com/getting-traction-and-funding-is-way-easier-with-a-great-brand. 4 Crunchbase. (2018). Crunchbase Profile for Epytom. [online] https://www.crunchbase.com/organization/epytom [Accessed 26 Sept. 2018]. This article is republished with permission from https://www.dnacademy.com/getting-traction-and-funding-is-way-easier-with-a-great-brand. Used With Permission.